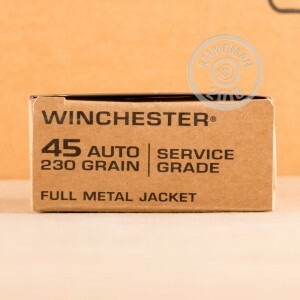 Winchester's "Service Grade" .45 ACP cartridges, available here in a 500 round case, offer an economical way to feed your 1911s and other .45 pistols at a reasonable price. This ammunition uses a conventional 230 grain full metal jacket bullet with a muzzle velocity of about 865 feet per second. As a standard pressure load, it will work well in older or compact pistols as well as full-size ones. These cartridges are loaded in Oxford, Mississippi using non-corrosive Boxer primers and brass cases. 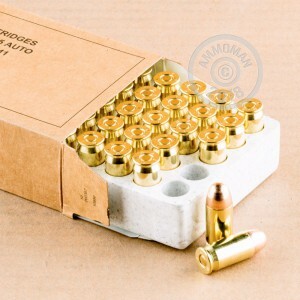 AmmoMan.com offers free shipping on all orders over $99 including most 500 and 1,000 round cases. Order today to earn double digit savings! Excellent mil spec surplus made in America! I've shot this ammo many times and it shoots great with no issues at all! Great practice ammo for all 45 ACP's. You won't find a better price anywhere else either! shot 100 rounds in ruger .45 auto and colt officers model last week. reliable, accurate, powerful stuff . misfires, no failure to feed. will buy more. I have used this ammo before and ordered this for stash/have on hand ammo. Reliable product! I shot my first USPSA and practice matches with this ammunition, 700 rounds were 100% reliable. Overall great ammo, only had a few duds our of the 1000 ordered. Ordered 1000 rounds, only had a few duds and one casing that was too long and did not load properly. In the end, I would definitely buy this ammo again.